Whenever someone sends you a Word document as email attachment, you have several options to view the file in question: you can either double-click on it to open inside either Word 2007 or the free Microsoft Word viewer; alternatively, you can right-click on the attached document and choose "Save As" to download it to your computer hard drive, and then open it like a regular Word file. 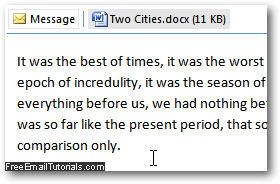 Finally, as you'll learn in this tutorial, you can also preview Word 2007 documents right inside Outlook 2007 or Outlook 2010. First, click on the email message that contains the Word file to select it. Depending on your Outlook 2007 Reading Pane settings, the body of the email will load on the right hand side of the screen, or at the bottom; if you have disabled and hidden the Reading Pane, just double-click on the email message to open in its own window. Either way, you will see the email headers (From sender, email recipients, and subject line). Below them, you will see virtual "tabs" that allow you to switch between the content of the selected email, and any attachment it contains. 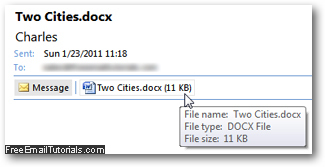 To view the content of the attached Word document, click on the "Preview file" button as shown on the screenshot above; if you no longer want to see that security notice when you try to preview Word files in the future, simply uncheck the "Always warn before previewing this type of file" checkbox. This is the easiest way to preview the content of a Microsoft Word file you have received as email attachment! If you want to return to the content of the email message itself, just click on the "Message" icon on the left of your listing of attachments, and Outlook 2007 will revert to its normal "email view". ...And as mentioned earlier in this tutorial, you can also right-click on the Word attachment itself, and choose "Save As" after you've previewed it, and save inside your Documents folder or another location on your computer. For more info on the word processor part of Microsoft Office, please visit our Word 2007 Tutorial or Word 2010 Tutorial.